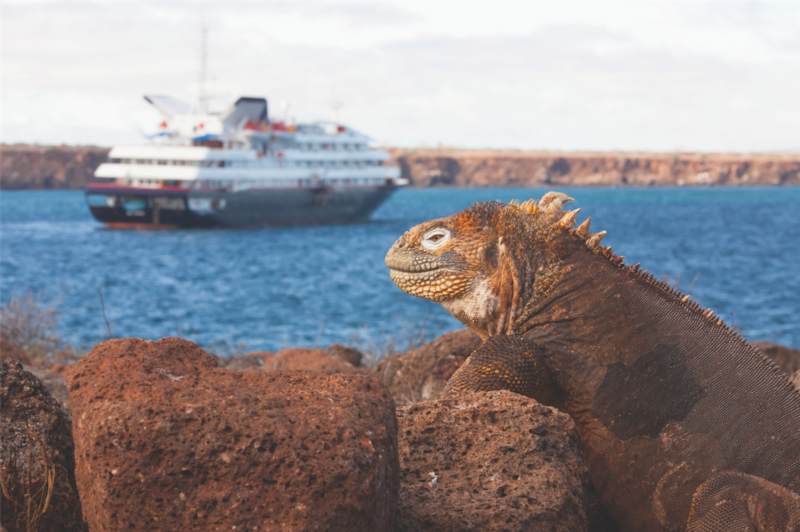 Silversea Expeditions has recently launched the first of two new seven-night Galapagos itineraries. The 100-guest, all-suite Silver Galapagos will operate the alternate itineraries which are approved by the Galapagos National Park Service, both departing on Saturdays. Departing from Baltra for the first time last week, the new North Central itinerary showcases the Galapagos Islands en route to San Cristóbal. In addition to a newly added circumnavigation of Isla Daphne Grande (Daphne Major), the voyage explores Bahia Darwin and El Barranco in Genovesa; Galapaguera Cerro Colorado and Punta Pitt in San Cristóbal; Bahía Gardner (Gardner Bay) and Punta Suarez in Española; El Edén, Fausto Llerena Breeding Centre and Puerto Ayora in Santa Cruz; as well as Bahía Sullivan, Seymour Norte, Rábida, and Plazas Sur. Highlights of the voyage include climbing Prince Philip’s Steps to see a thriving sea bird colony, hiking up the sides of an extinct volcano, and watching Red-footed and Blue-footed Boobies. The new Western itinerary from San Cristóbal to Baltra is enhanced by new points of interest such as Cerro Dragón and Playa Las Bachas in Santa Cruz and a circumnavigation of Roca León Dormido (Kicker Rock). The voyage will also visit Punta Vicente Roca, Caleta Tagus and Bahía Elizabeth in Isabela; Post Office Bay, Islote Champion and Punta Cormorant in Floreana; Los Gemelos, Fausto Llerena Breeding Centre and Puerto Ayora in Santa Cruz; Bartolomé, Playa Espumilla, and Punta Espinoza. Complimentary expeditions ashore are guided by an experienced Expedition Team (certified by the Galapagos National Park Service). On the all-inclusive Silver Galapagos guests have lectures by a qualified Expedition Team, fine dining options, complimentary wines and spirits in suite and throughout the ship, and a butler service in every suite. For a list of Silver Galapagos itineraries,visit Silversea.com/ships/silver-galapagos.